Boiron Arnicare Cream Value Pack contains both a topical cream and oral pellets. Warnings: For external use only. Avoid contact with eyes and with open wounds. Do not use if tube seal is broken. Stop use and ask a doctor if condition persists for more than 3 days or worsens. Keep out of reach of children. If swallowed, get medical help or contact a poison control center right away. 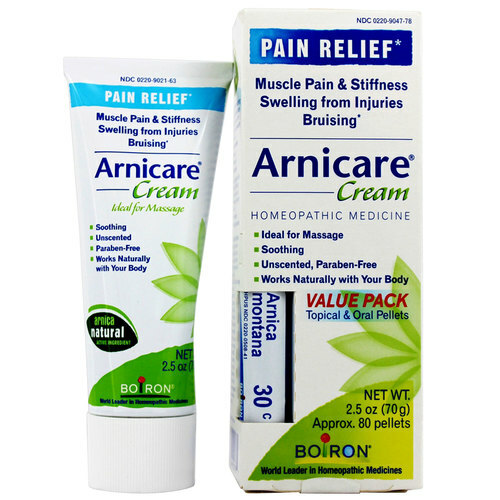 Arnicare Arnica Cream Active Ingredients: Arnica montana 1X HPUS 7%. Inactive Ingredients: Alcohol, caprylyl glycol, carbomer, cetyl palmitate, EDTA disodium, glycerin, lauroyl macrogolglycerides, pegoxol-7 stearate, purified water, sodium hydroxide, sorbic acid, 1, 2-hexanediol. Arnica montana 30C Pellets Active Ingredients: Arnica montana. Inactive ingredients: lactose, sucrose. Arnica montana Pellets: Adults and children 2 years of age and older: Dissolve 5 pellets in the mouth 3 times a day until relieved or as directed by a doctor. Arnicare Cream: Apply a thin layer of Arnicare Cream to affected area as soon as possible after minor injury. Repeat 3 times a day or as needed.